Built for the 2017 Brickstory contest. 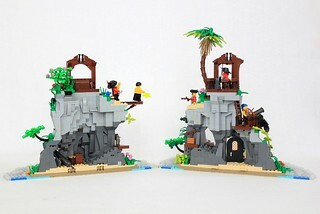 I’ve been wanting to do some more pirate themed builds for a while now, and the Brickstory contest provided a great opportunity with its ‘Age of Piracy’ category. The island can split in half to reveal a path, cannon, and other details inside, and the winch holding the boat is fully functional. 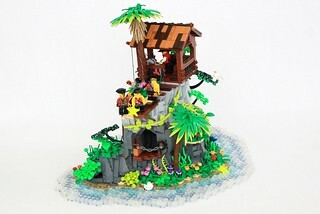 This paradise of a pirate island serves as the base of operations for Captain Hookey Hand and his crew. With everything from canons and lookout towers, to sun-bathing boats and planks to walk, the island is incredibly popular with his band of compatriots. 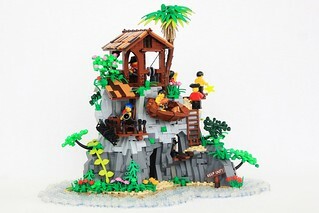 That's a great little islet. I especially like the way it feels complex without being massive, and the way you've made it click together when closed is quite clever. Azaghal wrote: That's a great little islet. I especially like the way it feels complex without being massive, and the way you've made it click together when closed is quite clever.